Farrar, Straus and Giroux, 9780374101008, 560pp. What happens when you take on the establishment? In Adults in the Room, the renowned economist and former finance minister of Greece Yanis Varoufakis gives the full, blistering account of his momentous clash with the mightiest economic and political forces on earth. After being swept into power with the left-wing Syriza party, Varoufakis attempts to renegotiate Greece’s relationship with the EU—and sparks a spectacular battle with global implications. Varoufakis’s new position sends him ricocheting between mass demonstrations in Athens, closed-door negotiations in drab EU and IMF offices, and furtive meetings with power brokers in Washington, D.C. He consults and quarrels with Barack Obama, Emmanuel Macron, Christine Lagarde, the economists Larry Summers and Jeffrey Sachs, and others, as he struggles to resolve Greece’s debt crisis without resorting to punishing austerity measures. But despite the mass support of the Greek people and the simple logic of Varoufakis’s arguments, he succeeds only in provoking the fury of Europe’s elite. Varoufakis’s unvarnished memoir is an urgent warning that the economic policies once embraced by the EU and the White House have failed—and spawned authoritarianism, populist revolt, and instability throughout the Western world. 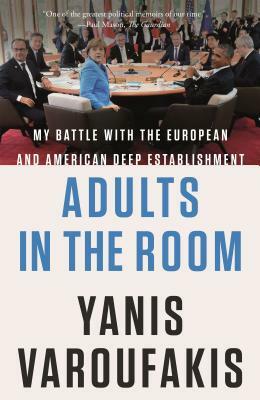 Adults in the Room is an extraordinary tale of brinkmanship, hypocrisy, collusion, and betrayal that will shake the global establishment to its foundations. Yanis Varoufakis is the former finance minister of Greece and the co-founder of an international grassroots movement, DiEM25, campaigning for the revival of democracy in Europe. He is the author of And the Weak Suffer What They Must? and The Global Minotaur. After many years teaching in the United States, Britain, and Australia, he is currently professor of economics at the University of Athens.